Twitter aired its first ever TV commercial today during the 2012 Pocono 400 Nascar race. 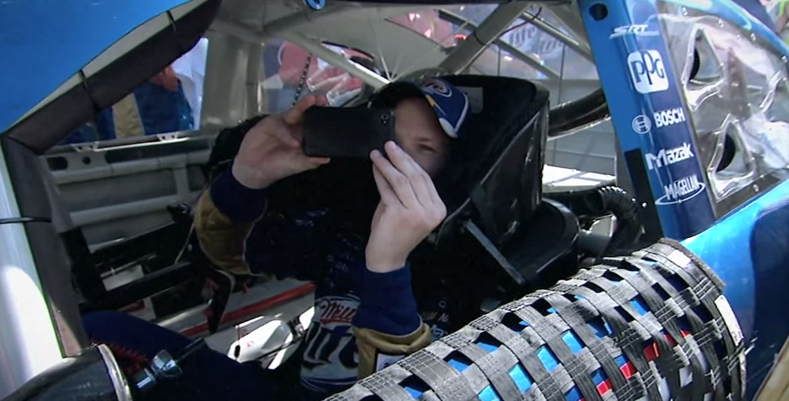 The ad features driver Brad Keselowski, who finished in a disappointing 24th place, using his phone to share his point of view with the world. The ad is the first on the list below, but is part of a series of similar ads promoting one URL http://twitter.com/#nascar which immediately redirects to http://twitter.com/hashtag/nascar. The new hashtag page is simply a Nascar branded page with a stream of tweets, and people strongly related to Nascar and the race. Throughout the weekend – but especially during the race – a combination of algorithms and curation will surface the most interesting Tweets to bring you closer to all of the action happening around the track, from the garage to the victory lane.Anyone watching the Pocono 400 on Sunday — even if you’re not a current Twitter user — can visit twitter.com/#NASCAR watch the race unfold from every angle, and get insider access to all the places the cameras can’t take you. For example, teams will update you with information about how their car is performing in the race and what their strategy will be when they come into pit road. You’ll also see photos from the pit and read what the drivers and spotters are saying in the heat of the moment.